Graphics courtesy of Long Beach Animal Care Services (ACS). The 2017 Long Beach Animal Care Services (ACS) statistics for impounds, live release and euthanasia show continuous improvement in live release, euthanasia and impounds, with a slight rise in the wrong direction for impounded cats. At the Open House on February 10, ACS Manager Ted Stevens expressed hope for its continuation. In recent years, many shelters have stepped up their awareness of practices that would work toward no-kill status and have enacted many of them. The goal of any pet advocacy community is to have the best outcome for every shelter pet. The term no-kill, defined by the nationwide animal-welfare endowment organization Maddie’s Fund, would be “a place where all healthy and treatable animals are saved and where only unhealthy and untreatable animals are euthanized.” Long Beach’s pet advocacy community members are vocal and active in trying to attain this goal, and it must be remembered that shelter staff members and volunteers are also part of this community. They, too, would like such an outcome. In the years since ACS stepped away from being just “animal control,” practices such as offering adoptions (previously done only through their neighboring organization spcaLA), opening a Dog Play Yard and trained its volunteers to utilize specialized techniques in managing the behavior, and worked with Live Love Rescue to create a Foster the Fourth during the days surrounding July 4 to make room for frightened animals who enter the shelter in terrified droves when the firecrackers start banging and whistling. This is not by any means an exhaustive list, and there’s sometimes a perceptual discrepancy between what the shelter can presently do considering its strained resources and what the community wants done sooner rather than later. Presently, ACS is dealing with implementing the many recommendations of Phase I of a city audit that is in progress now. The statistics point in the right direction, but it’s not a downhill roll. It’s an effort that’s going to take the entire village pushing the rock, and it often gets as exhausting as Sisyphus must have felt. 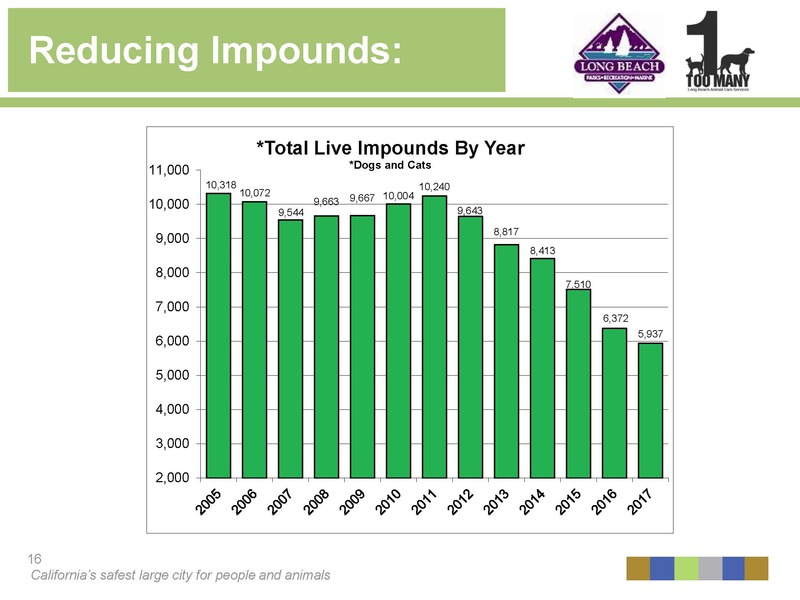 Stevens reported a significant drop in impounds—dogs and cats, mainly, but other animals such as snakes, tortoises and rabbits as well. The number of total impounds has been cut nearly in half since 2011, and Stevens hopes to keep that number under control. He credited groups like Friends of Long Beach Animals and Fix Long Beach providing free spay/neuter and education to the public. Various social media platforms, he said, are also helping to reunite people and pets. Cat impounds have shown a slight increase, although Stevens noted that the number is nearly the same as last year’s and is similar to a “stair pattern” in a couple of pairs of years. He hopes for a drop again this year. 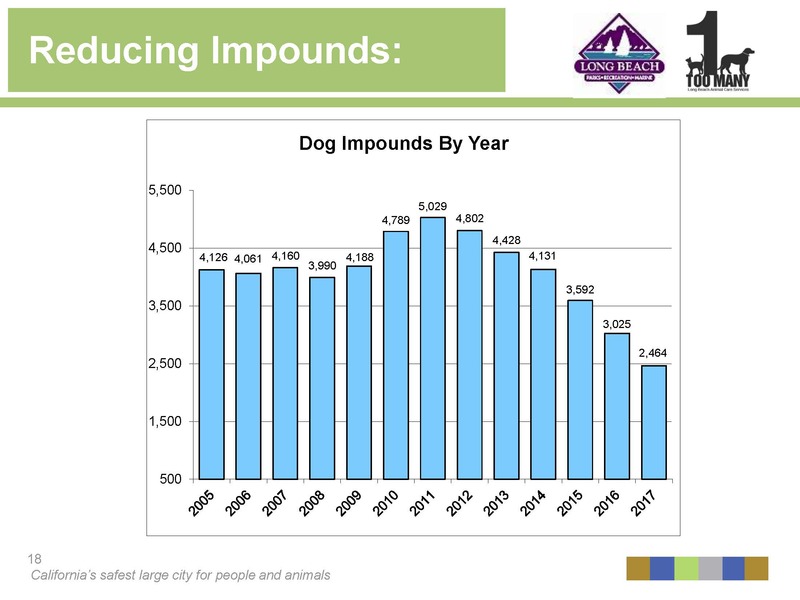 There was a huge drop in dog impounds similar to the one in 2015, with fewer than 200 puppies. This result might be attributed to increased spay/neuter awareness and implementation. 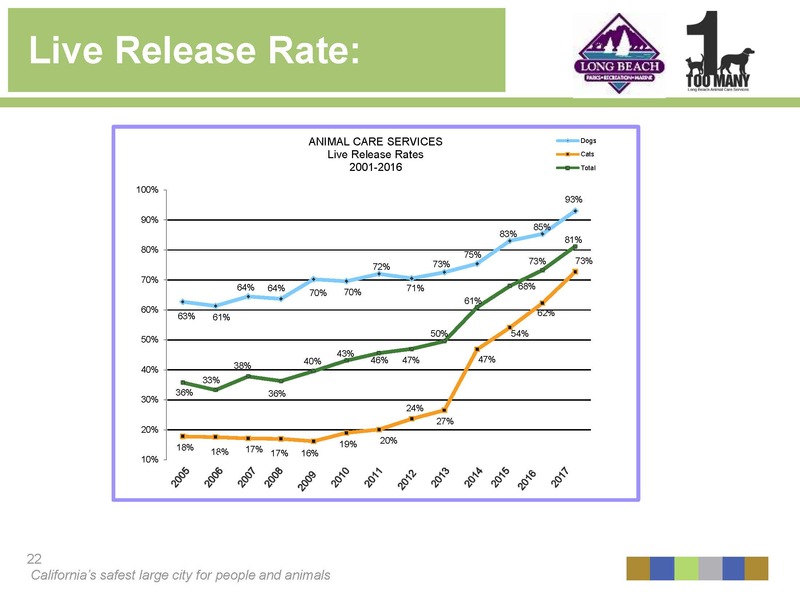 Live-release numbers are also continuing their upward movement, with dogs at an impressive 93 percent. 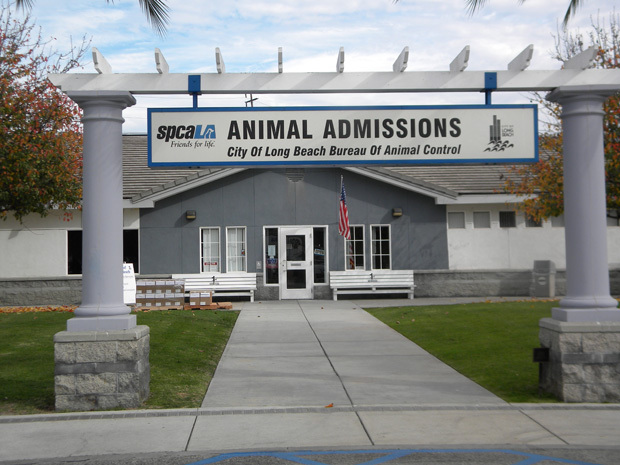 Live release consists of animals returned to their owners, adopted from the shelter, pulled by rescues, transported to other parts of the country, and selected by spcaLA for their private rescue that shares the P. D. Pitchford Companion Animal Building where both entities are housed. For the last two years, cats have also been transferred to shelter’s satellite adoption center sponsored by Pet Food Express in Long Beach, and this, too has helped with the numbers. ACS also has accounts on Facebook and Instagram, with shareable photos and videos. A live Twitter feed helps to reunite pets with their owners, and shelter visitors can often be seen taking photos with their devices and sharing them. 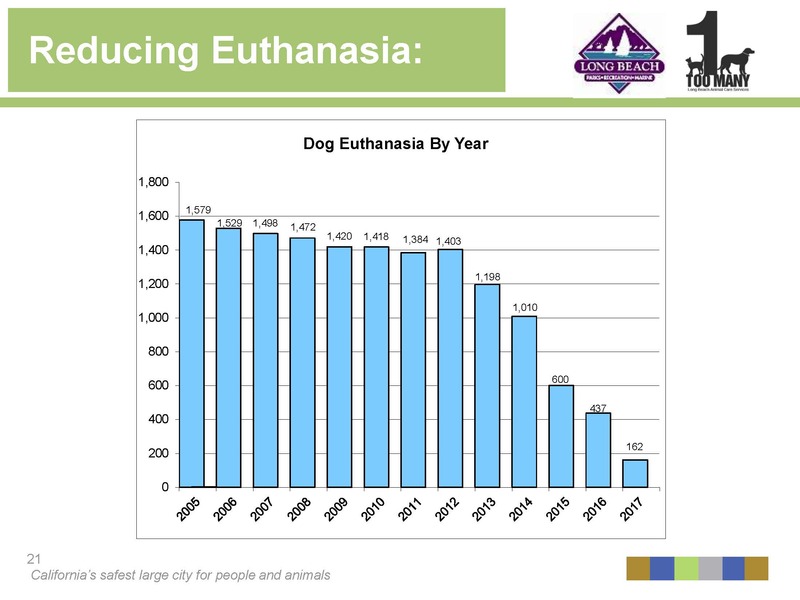 Euthanasia rates, no matter how improved, will always elicit strong emotion on the part of every animal advocate, including the ones who have to put the pets to sleep themselves. A sick, suffering pet will always be mourned even if taken out of its suffering, but a healthy animal that has no reason to be euthanized other than there being no room in the shelter fuels the outrage that took root in animal advocates during the 1990s when the no-kill movement began to gain momentum. Maddie’s Fund’s definition of the term stresses “healthy and treatable”; in no way can a shelter expect to continue the life of a suffering pet for which treatment will give no results, and there will always be a percentage of pets and wildlife as well who will need to be given the last kindness. 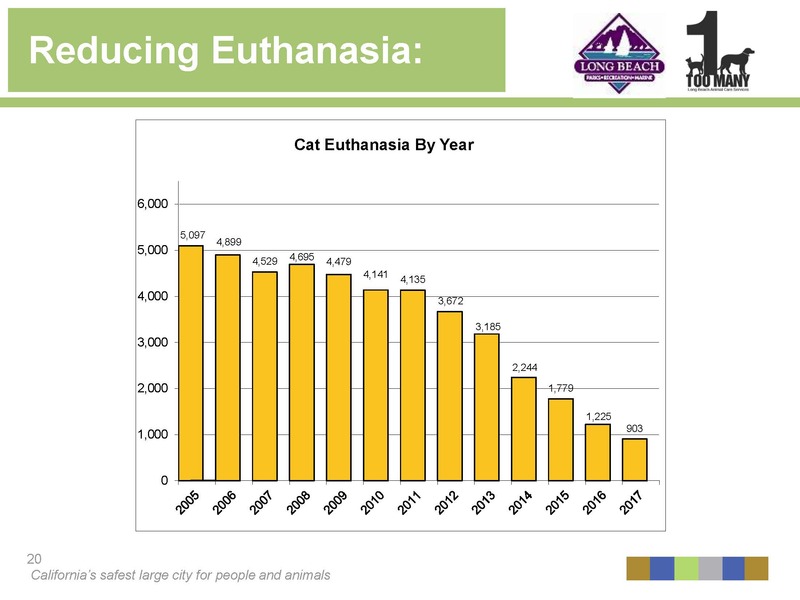 Canine euthanasia rates declined from a peak in 2012, and those of felines have gone down steadily since 2005 and showed a sharp drop in 2012. 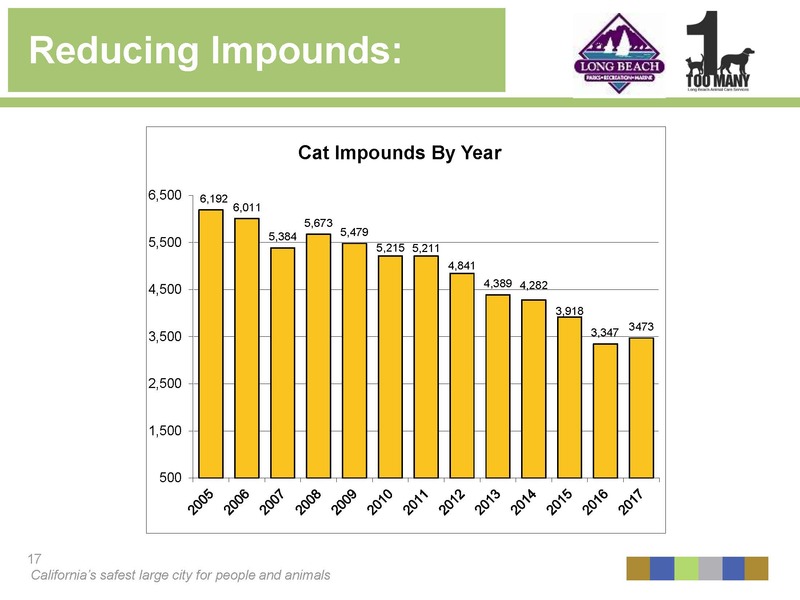 The rates continued their decline in 2017, and Stevens attributes this in part to the smaller number of impounded pets, i.e., the fewer animals brought in, the less that have to be euthanized. The increasing live-release numbers are also a factor. Stevens did stress that impounds aren’t “just the happy, healthy cuddly dogs.” There are a considerable number of animals hit by cars or mangled by other animals, and there are cats, dogs and rabbits that come in with potentially fatal illnesses that are near the terminal stage. Even though some of these pets are released to hospices and rescues, there are only so many placements for them. A considerable number of euthanized pets are newborn kittens. Again, the numbers of neonatal cats put to sleep has been reduced because of efforts of rescues like The Little Lion Foundation, Jellicle Cats Rescue Foundation, the Cat Cove, and independent neighborhood groups of feeders like Wrigley Kittens. Stevens particularly commended Helen Sanders CatPAWS for creating Kitten Kits. The kits are given to the shelter, which provides them free of charge to people who have found motherless litters to encourage them to nurse them to health. Again, however, there are only so many feeders, and when kitten season births countless litters to unspayed mothers, there’s not a one-to-one rate. As the shelter’s motto reads, any euthanized animal that would have had a chance at life is one too many, and no-kill advocates see eye to eye with the shelter there. To set the stats at zero for euthanasia and 100 percent for live release would take a village—in fact, an entire community of everyone from shelter employees and animal advocates to those who simply own a pet. No one ever said that this was easy. It is crucial to create a culture where you try new ideas and see if they work to save lives—even if they don’t, you still have made it clear that it is okay to try. To volunteer at the shelter and help push the rock uphill, visit this page. Opportunities exist for youth and young adults as well.